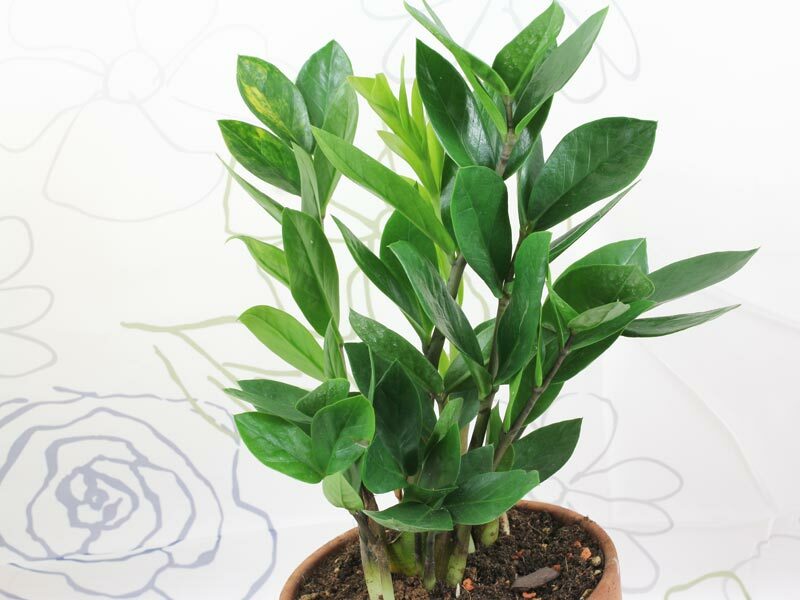 Zamioculcas zamiifolia has a lot of common names such as Aroid or ZZ Palm, Zanzibar Gem but is best known as the Zamioculcas. The native to Africa (Kenya, South Africa) plant is the only member of its genus wich belongs to the araceae family. 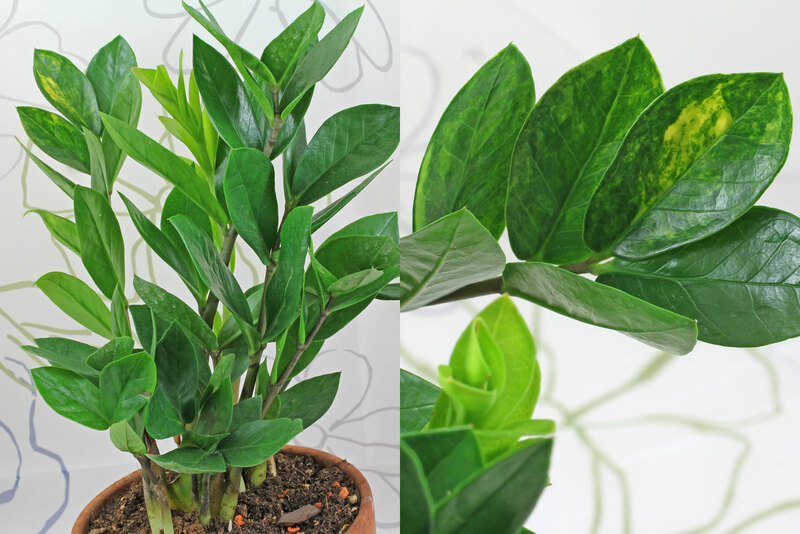 The botanical name Zamioculcas is based on Zamia furfuracea, a member of the (not related) Zamiaceae family and means “with leaves like Zamia”. Zamia furfuracea (left) & Zamioculcas (right). 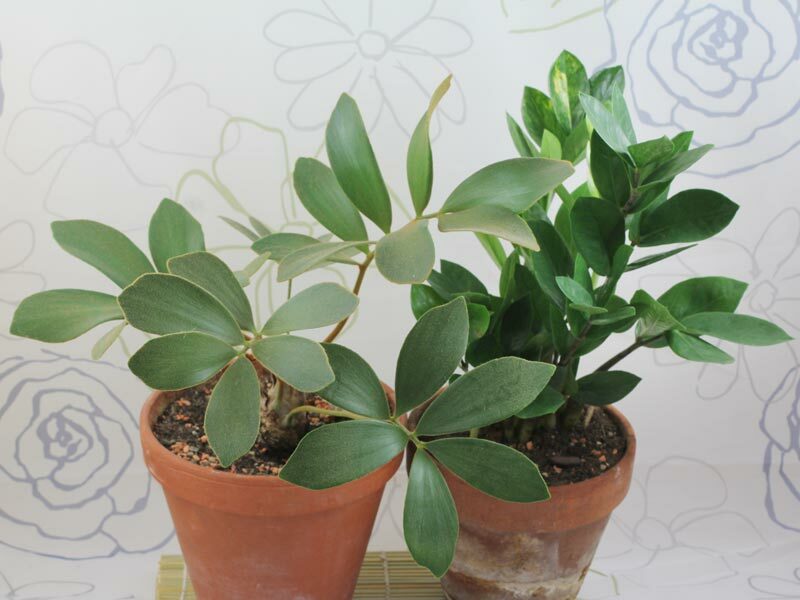 Lighting: The Zamioculcas does best if located from bright to light shaded with some morning or evening sun. A shaded place will be tolerated but keeps the plant even grow more slowly. During summer it can be placed in the garden or on the balcony. But make sure that rainwater easily can flow out of the pot. Sitting in water will cause rot. Soil: A well drained soil is welcome. I’m using a mix of potting soil, lay granulate, pumice and coarse sand (1:1:1:1). A standard cacti mix can also be used. Watering: If placed at room temperature (20-30 °C/68-86 °F) the Aroid Palm can be deep watered. What’s flowing out of the pot’s hole has to be removed after a few minutes. Allow to dry before adding water next. This plant is drought tolerant and can go for a long time without watering. Feeding: A half diluted water soluble fertilizer can be given monthly in spring/summer and if placed at room temperature every six to eight weeks in fall/winter. New bought or recently repotted plants donTt need to be fed for the first 12 months. Forgetting to feed from time to time will cause no harm. 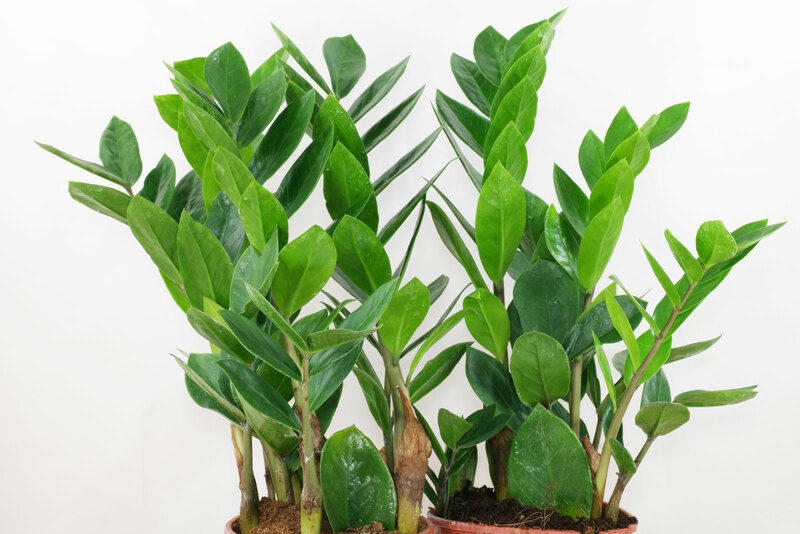 Temperature: Zamioculcas zamiifolia is best grown at room temperature the year round and needs a winter minimum of 14 °C/57.2 °F. At this temperature range watering has to be reduced and it don’t need to be feeded. 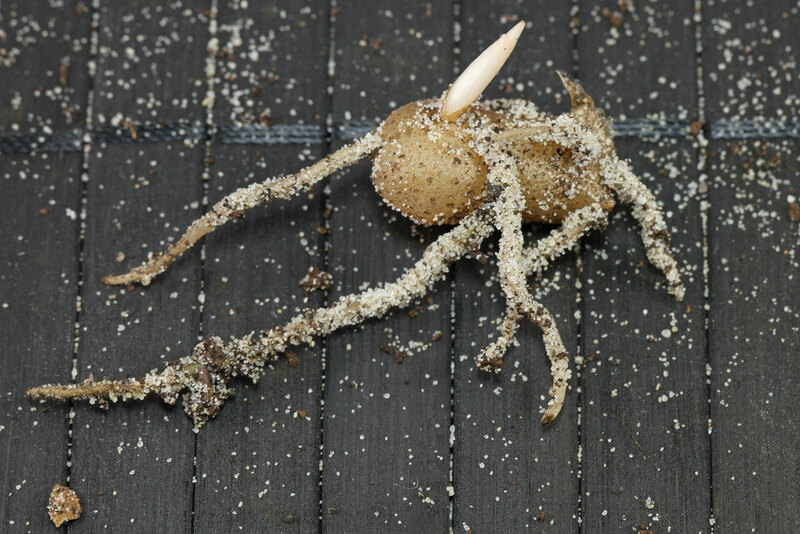 Part of the rhizome and the roots. 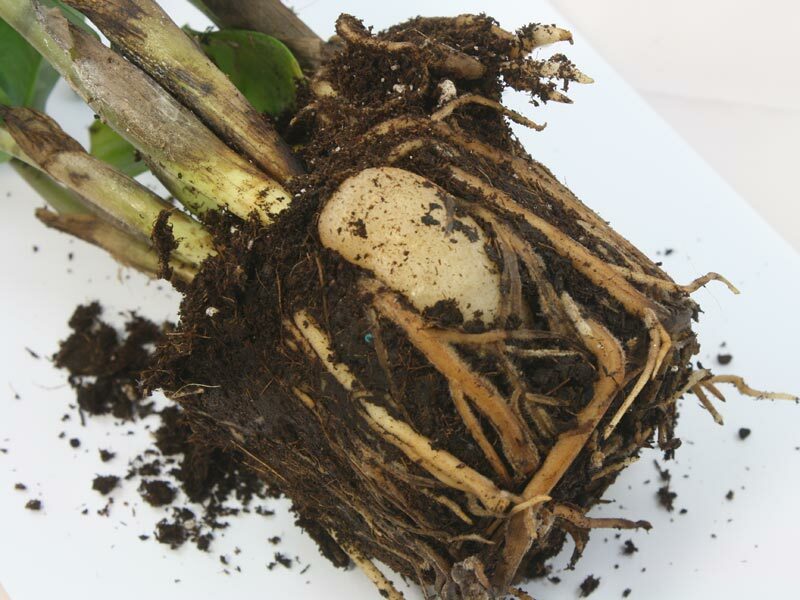 The Zamioculcas can be propagated with leaf cuttings or by division of the rhizomes. 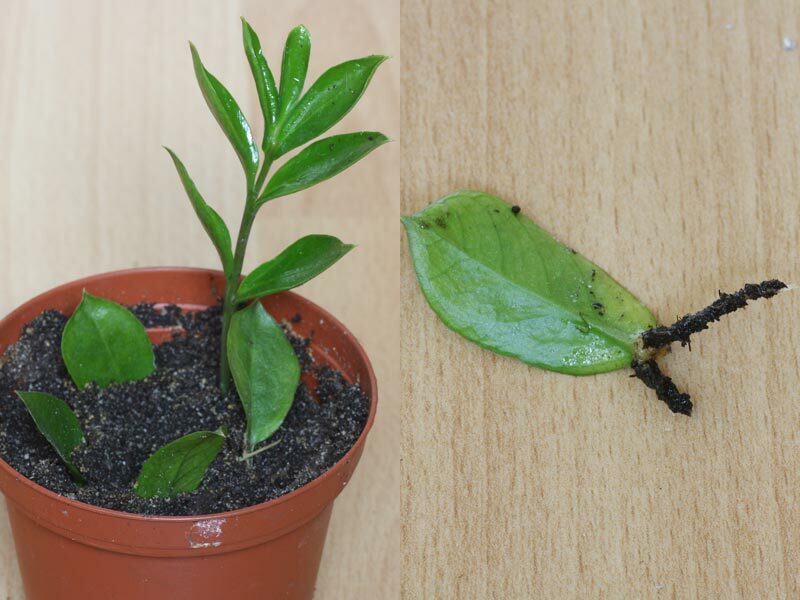 Leaf cuttings: At first cut off the leaves with a sharp and clean knife. Then stick them into the soil. I’ve used a standard cacti mix. Put the pot on a bright but not sunny place with a temperature > 20 °C (68 °F). Keep the soil moderately moist and allow to dry between the waterings. A fertilizer must not be given. Also there is no need to increase humidity. Now you have to be patient. 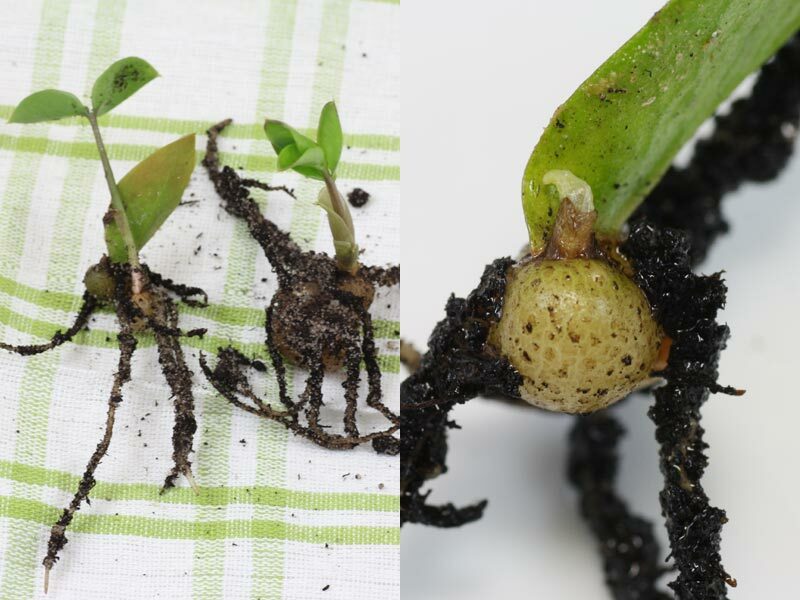 After six to eight weeks the Zamioculcas cuttings start to produce roots and tubers. Until they show leaves it may take a few months. 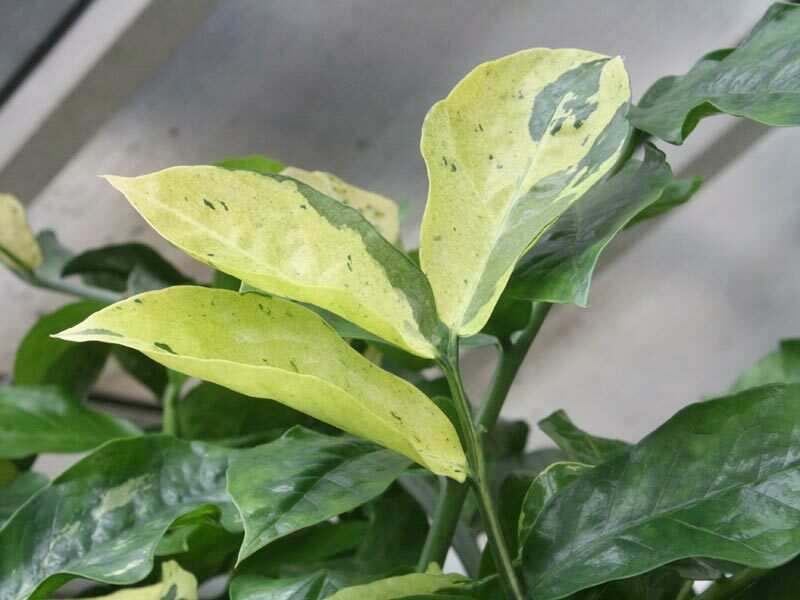 From Zamioculcas zamiifolia is a cultivar with yellow variegated leaves available. This variety i found at at Botanic Garden Berlin.